Give up on Micron? No way! Those of you who consistently follow along with me already know that long ago, I dug in my heels on Micron Technology (MU - Get Report) . As the share price has deteriorated over time, I had taken the necessary actions required of a good (hopefully) investor (notice, for this name, I did not call myself a trader) in order to degrade one's own net basis cost as well. Seems like only Monday that my well thought out (LOL) plan had worked like a charm. As of Thursday morning, not so much. About a week ago, we all felt like maybe Micron CEO Sanjay Mehrotra had talked up the stock. The company had lowered its own revenue expectations for the current quarter to $7.9 billion, a level that had been the very bottom of its prior range. Wall Street had broadly been above $8 billion for this item. However, Mehrotra increased EPS expectations to $2.92 from $2.92. The Street had been at roughly $2.94. Why? Well there are expectations out there that though both NAND pricing and DRAM pricing have been softer now for several quarter, that DRAM has not been quite as poor as previously thought. On top of that, in Mehrotra's announcement, he indicated already known supply issues regarding NAND memory chips would improve during Micron's fiscal second half. Micron will report its fiscal first quarter results in less than two weeks, on Tuesday, Dec. 18. Oh, and let's not forget that aggressive buyback. That helps EPS as well. Across Wall Street, a bevy of analysts lowered price targets while reiterating "buys" and "over-weights." My thinking is that with my cost basis already way down here (that took some finesse), I would take any of these price targets in heartbeat. Then came what appears to be increased tensions over trade with China. As Tuesday brought about questions over just how successful the meeting in Argentina had been, the news of the arrest of Huawei CFO Sabrina Meng has poured salt into a wound not healed. The problem? Even though on a per-earnings or even a per-sales basis, Micron appears extremely cheap, the Boise, Idaho-headquartered firm is reliant upon the Chinese economy for more than half of its revenue. Not a good time for a company in such a position. Hmm. I haven't dragged out the old Andrew's Pitchfork in a while. Sure, it was more fun when stocks were going the other way. Unfortunately, the stock hit resistance precisely where it should have, which is maybe how Citigroup derived its $40 price target last week. If so, kudos to them. 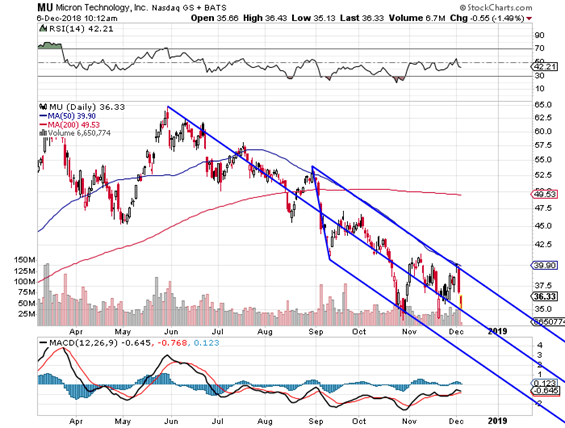 On Thursday MU is trading as if the central trend line should act as support. For me, my net basis is $36.08, so I have been on both sides of profitability Thursday. I will not add above $36. That said, the central trend line runs through $32.50 by year's end. For every 100 shares long, this will reduce net basis by $0.84, while increasing potential equity risk at what I think is a good value. The sale of the covered call reduces this trader's net basis to 35.72. If you would like to short the name, you'll have to read somebody else today. At the time of publication, Guilfoyle was long MU, short MU calls, short MU puts.